Refined to perfection, the Spice is the complete package for every level of riding. Making sure the diverse riding styles of the Light Team Riders are met, Light has taken everything they know about freestyle and freeride performance and blended it into the perfect package. Playful and confident anywhere you want to go, with a Multiradial Sidecut for quick, effortless turns, combined with a Lightweight Core and Kevlar Inlays, giving the board plenty of pop while remaining light and manoeuvrable. 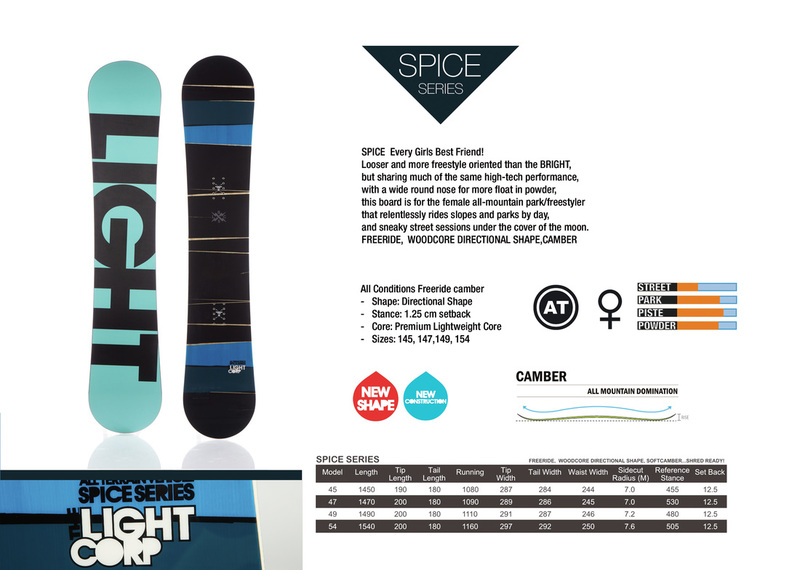 The Spice by Light is an all mountain board suited for all girls with a love for cruising the slopes or surfing powder lines.